Fancy hand blown glass beads in red, silver and gold handcrafted into a charming clipping candle ornament. Overall ornament is 2-1/2" tall. Handmade in the Czech Republic. Fancy hand blown glass beads handcrafted into an adorable clipping flower bouquet ornament. Overall ornament is 2-1/2" tall. Handmade in the Czech Republic. Hand blown glass beads handcrafted into an adorable bee holding flower ornament. Overall ornament is 2" tall. Handmade in the Czech Republic. 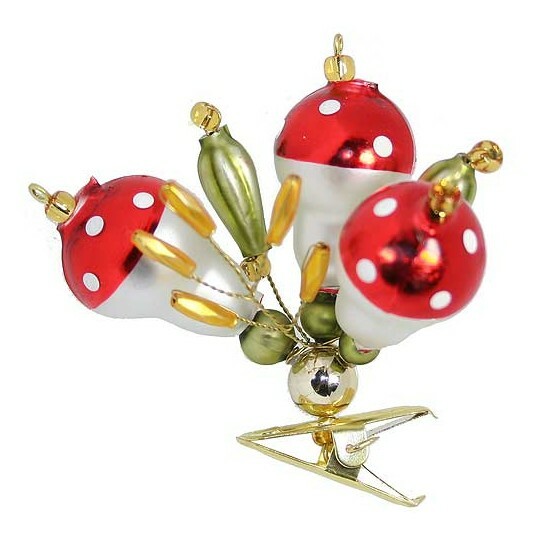 Fancy hand painted blown glass mushroom beads and matte green and gold beads handcrafted into a charming clipping mushroom ornament. 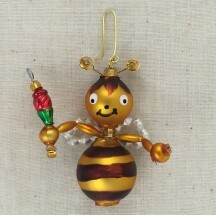 Overall ornament is 2-1/2" tall. Handmade in the Czech Republic. 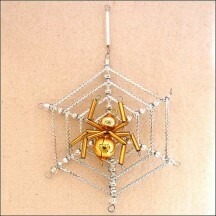 Glossy silver and gold glass beads handmade into a beautiful spider web ornament. 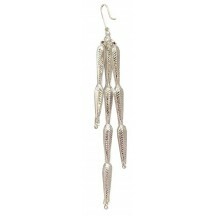 Webbing is created with a shimmering metalic silver fabric trim. 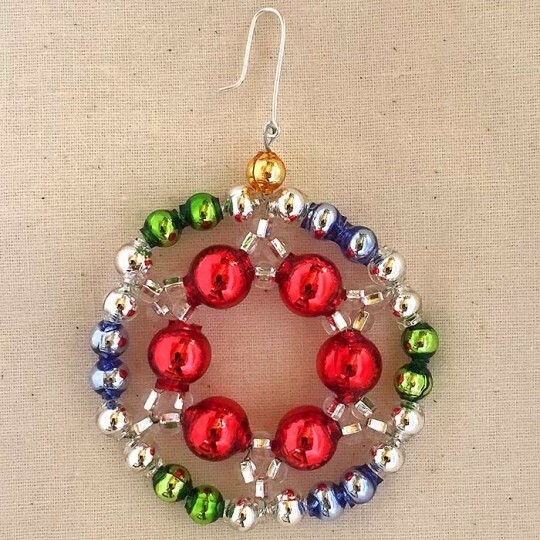 Overall ornament is 3" across, not including hanger. Handmade in the Czech Republic. 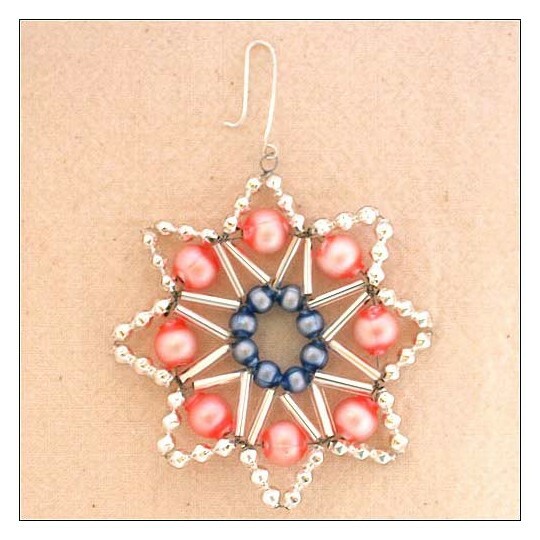 Glossy silver, blue and red blown glass beads handmade into a charming five-pointed openwork star ornament. 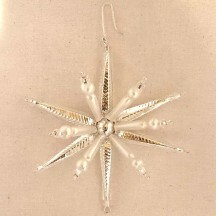 Overall ornament is 2-1/4" across, not including hanger. Handmade in the Czech Republic. 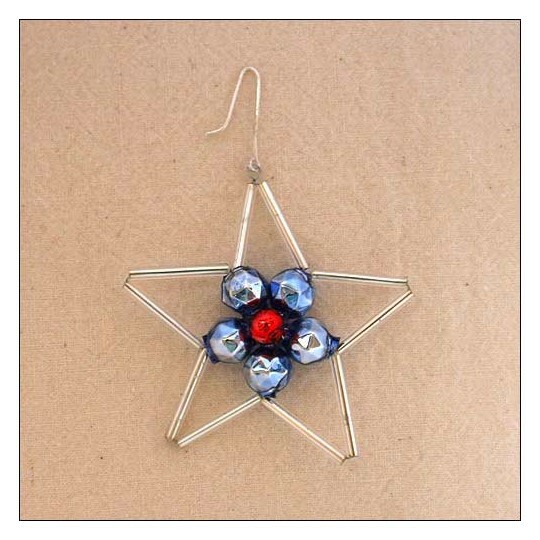 Glossy silver, gold, red, blue and green glass beads handmade into a fancy atomic star ornament. 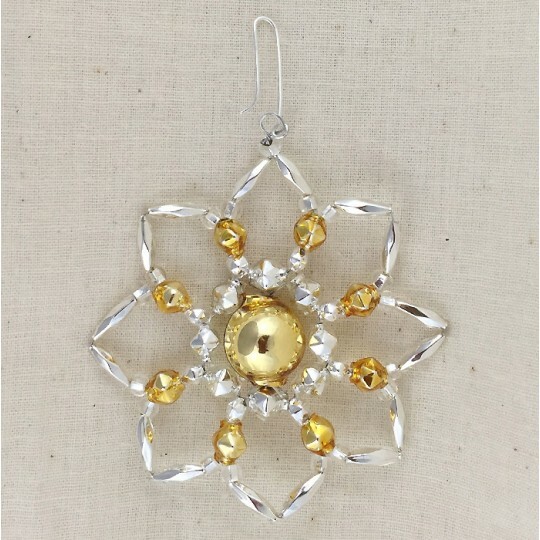 Overall ornament is 3" across, not including hanger. Handmade in the Czech Republic. Glossy silver, gold, red, blue and green glass beads handmade into a fancy fantasy shape ornament. 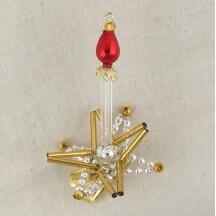 Overall ornament is 5" long and 2-1/2" across, not including hanger. Handmade in the Czech Republic. 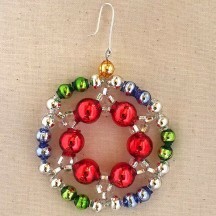 Glossy silver, green, red, blue and gold glass beads handmade into a fancy round ornament. 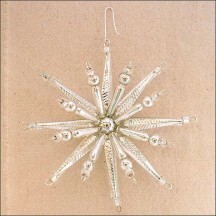 Overall ornament is 2-1/8" across, not including hanger. Handmade in the Czech Republic. 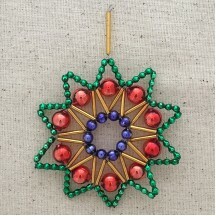 Glossy green, red and gold glass beads handmade into a fancy star ornament. 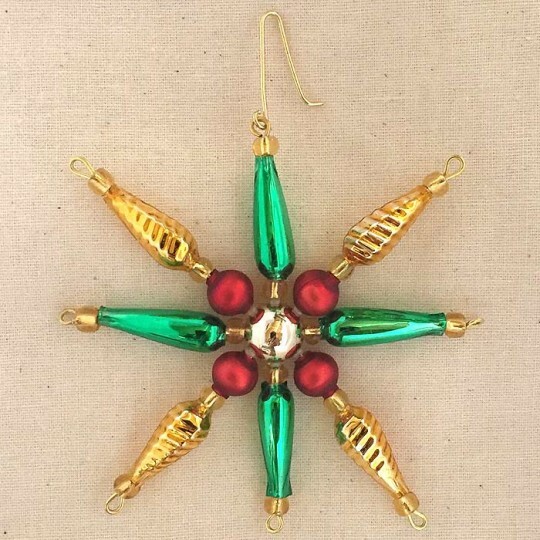 Overall ornament is 2-3/4" across, not including hanger. Handmade in the Czech Republic. 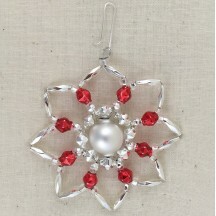 Glossy silver and red glass beads handmade into a charming bell ornament. 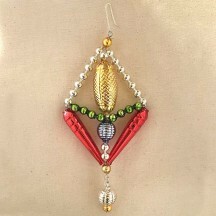 Overall ornament is 2-1/2" tall, not including hanger or ringer. 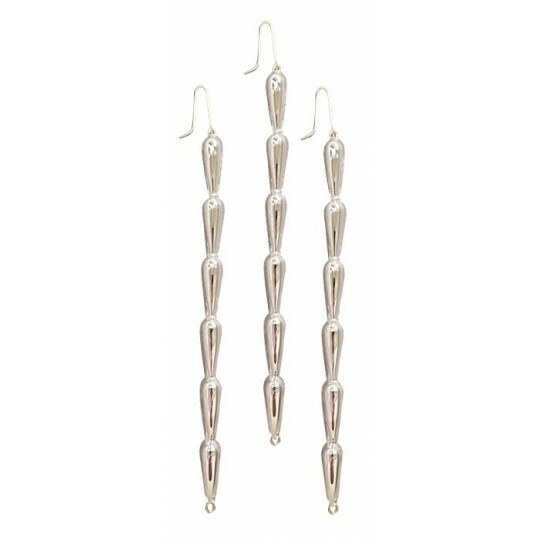 Handmade in the Czech Republic. 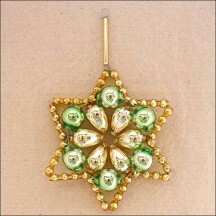 Glossy silver, gold and green and matte red glass beads handmade into a fancy star ornament. 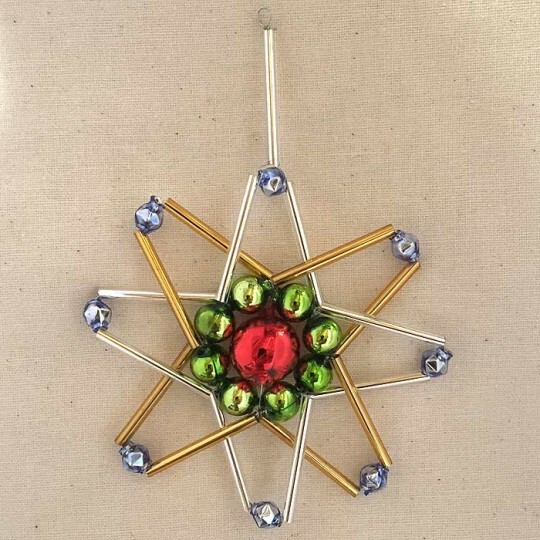 Overall ornament is 3-1/4" across, not including hanger. Handmade in the Czech Republic. 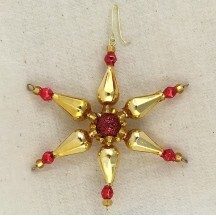 Glossy gold and red glass beads with a center red glittered bead handmade into a fancy star ornament. 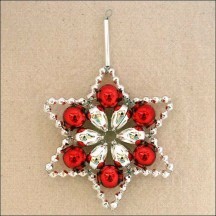 Overall ornament is 3-1/4" across, not including hanger. Handmade in the Czech Republic. 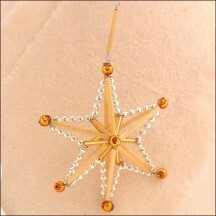 Glossy silver and gold glass beads handmade into a fancy star ornament. 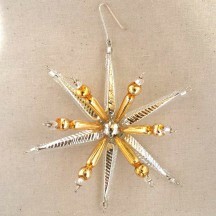 Overall ornament is 3-1/4" across, not including hanger. Handmade in the Czech Republic. 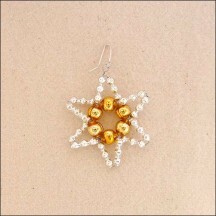 Glossy silver and gold glass beads handmade into a beautiful star flower ornament. 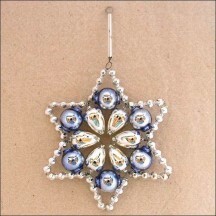 Overall ornament is 2-1/2" across, not including hanger. Handmade in the Czech Republic. 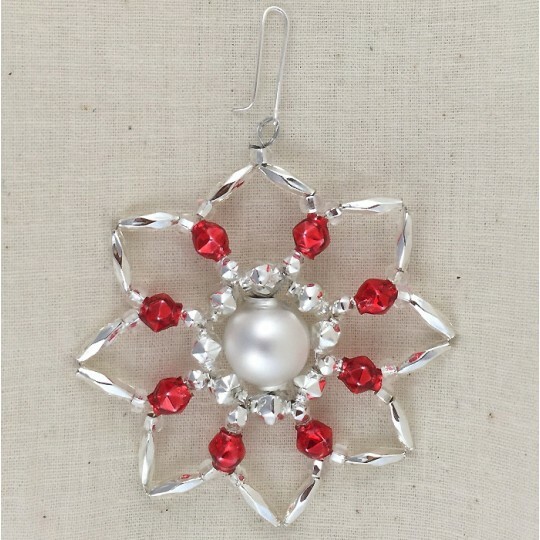 Glossy silver and red glass beads handmade into a beautiful star flower ornament with a matte white bead center. 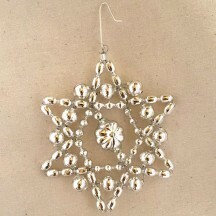 Overall ornament is 2-1/2" across, not including hanger. Handmade in the Czech Republic. 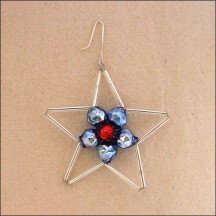 Glossy silver glass beads handmade into a beautiful star flower ornament. 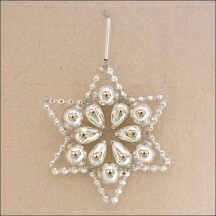 Overall ornament is 2-1/2" across, not including hanger. Handmade in the Czech Republic. 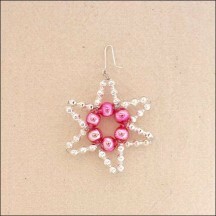 Glossy silver and matte pastel pink and blue glass beads handmade into a beautiful snow star ornament. 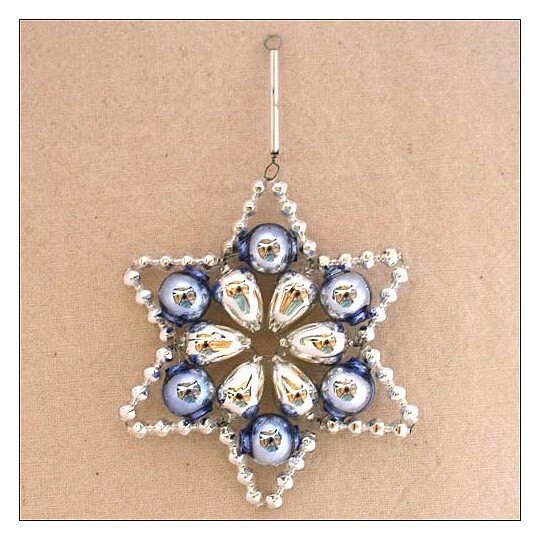 Overall ornament is 2-1/2" across, not including hanger. Handmade in the Czech Republic. 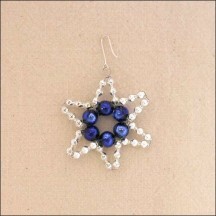 Glossy silver glass beads handmade into a beautiful bumpy star ornament. 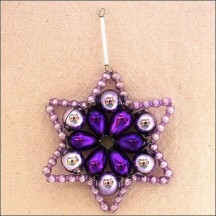 Overall ornament is 3" across, not including hanger. Handmade in the Czech Republic. 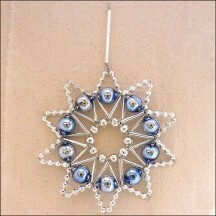 Glossy silver and blue glass beads handmade into a beautiful lace star ornament. 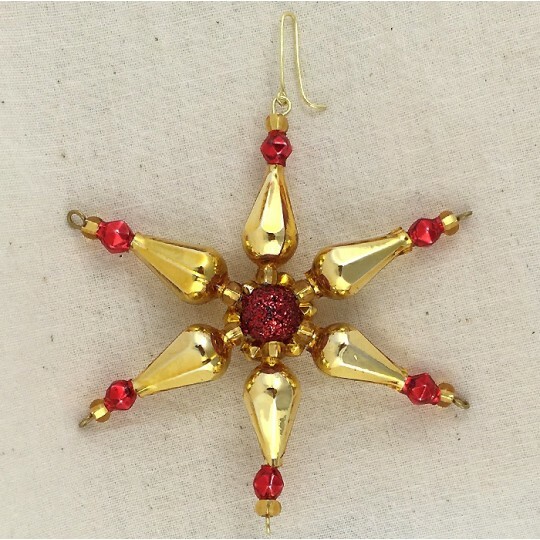 Overall ornament is 3" across, not including hanger. Handmade in the Czech Republic. 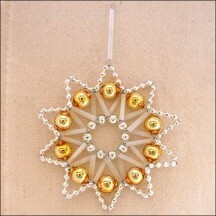 Glossy silver and gold with frosted white glass beads handmade into a beautiful lace star ornament. 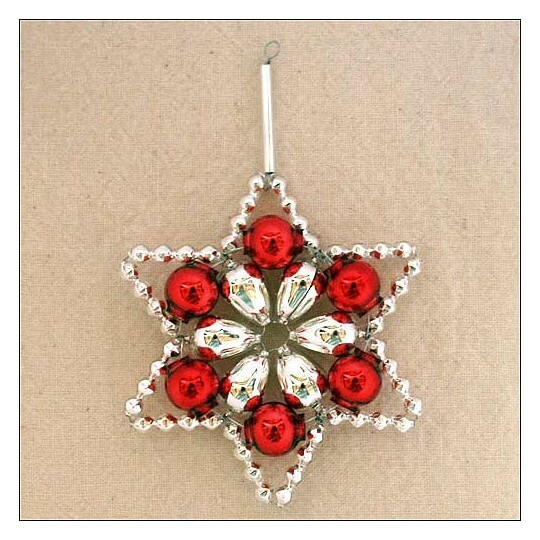 Overall ornament is 3" across, not including hanger. Handmade in the Czech Republic. Glossy red, green, gold and blue glass beads handmade into a beautiful lace star ornament. 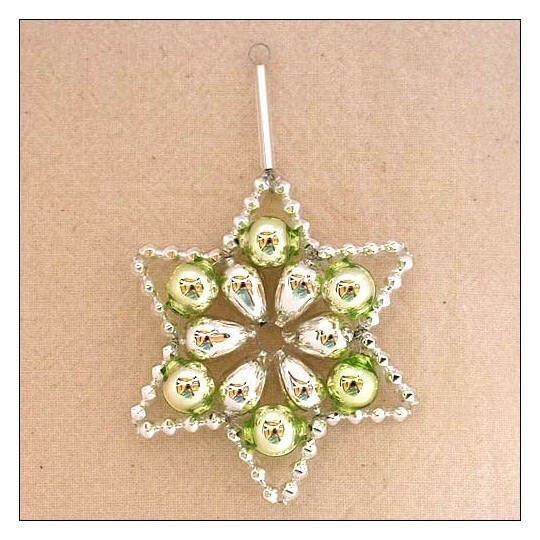 Overall ornament is 3" across, not including hanger. Handmade in the Czech Republic. 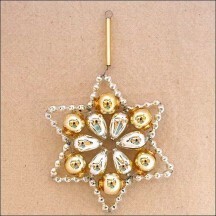 Glossy silver and gold with frosted gold glass beads handmade into a beautiful dimensional magic star ornament. 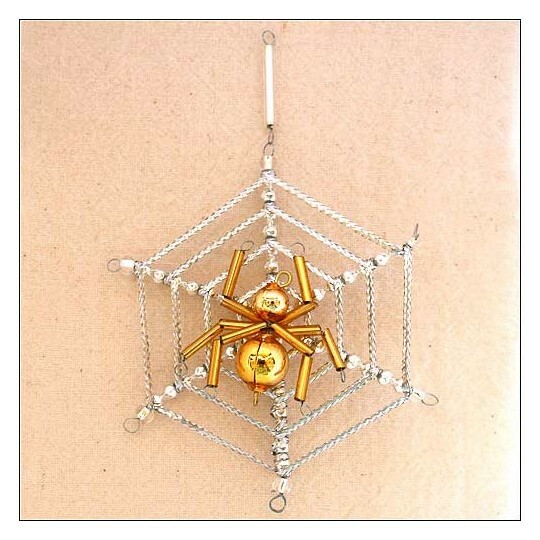 Overall ornament is 3" across, not including hanger; and 1" deep. Handmade in the Czech Republic. 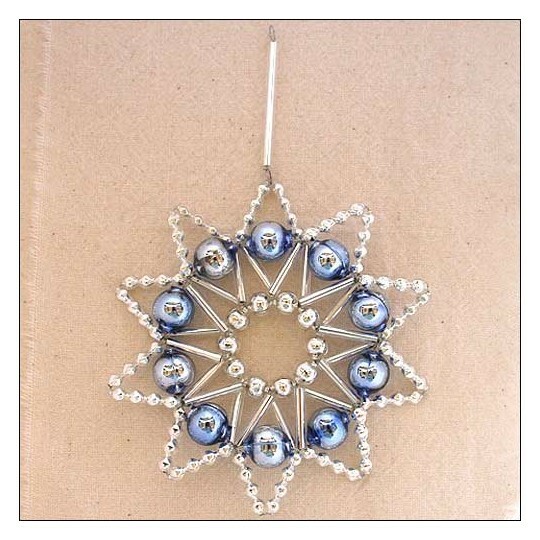 Glossy silver and pale blue glass beads handmade into a beautiful celestial starburst ornament. 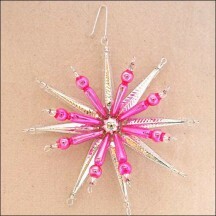 Overall ornament is 3-1/2" across, not including hanger. Handmade in the Czech Republic. 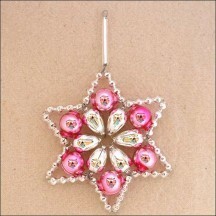 Glossy silver and hot pink glass beads handmade into a beautiful celestial starburst ornament. 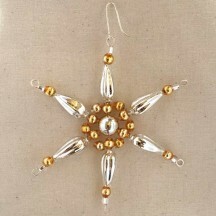 Overall ornament is 3-1/2" across, not including hanger. Handmade in the Czech Republic. 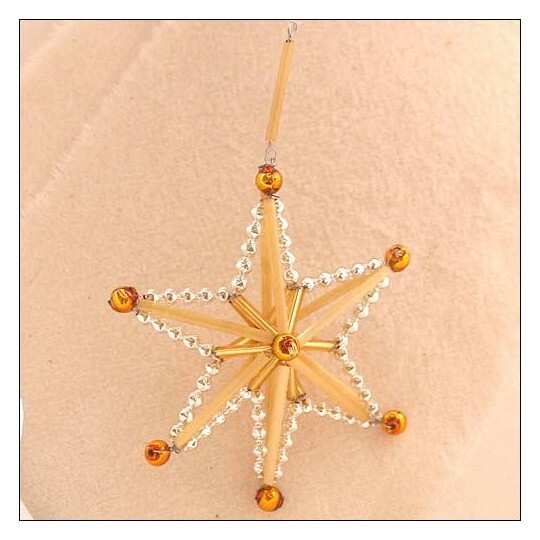 Glossy silver glass beads handmade into a beautiful celestial starburst ornament. Overall ornament is 3-1/2" across, not including hanger. Handmade in the Czech Republic. 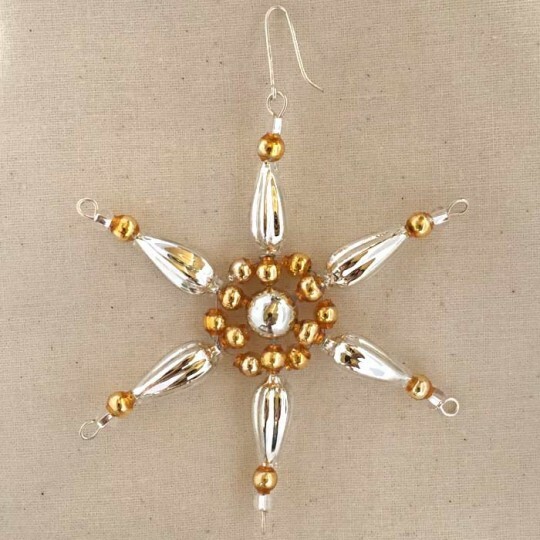 Glossy silver and gold glass beads handmade into a beautiful celestial starburst ornament. 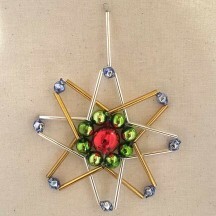 Overall ornament is 3-1/2" across, not including hanger. Handmade in the Czech Republic. 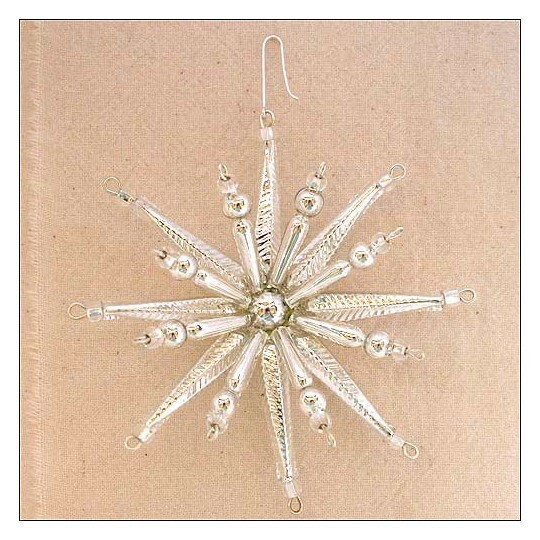 Glossy silver and matte white glass beads handmade into a beautiful celestial starburst ornament. 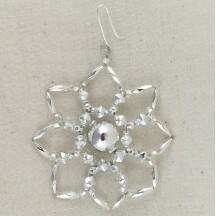 Overall ornament is 3-1/2" across, not including hanger. Handmade in the Czech Republic. 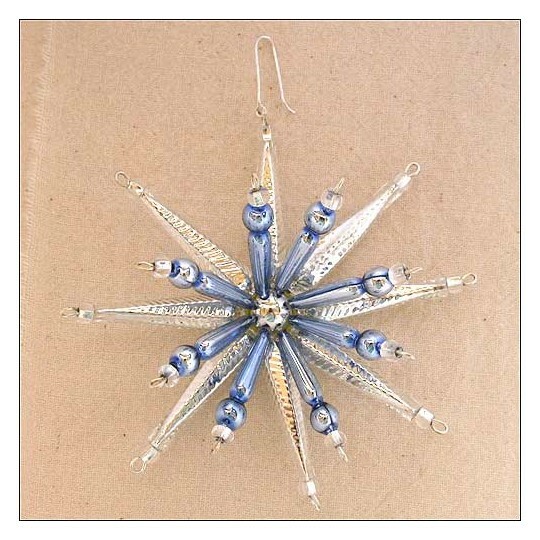 Glossy silver and blue blown glass beads handmade into a charming petite star ornament. 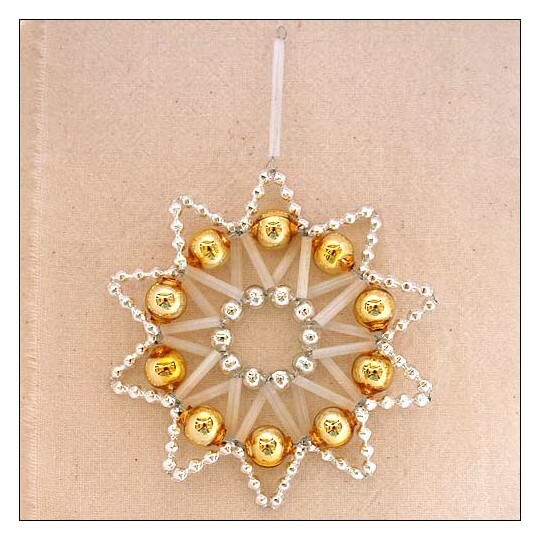 Overall ornament is 1-3/4" across, not including hanger. Handmade in the Czech Republic. 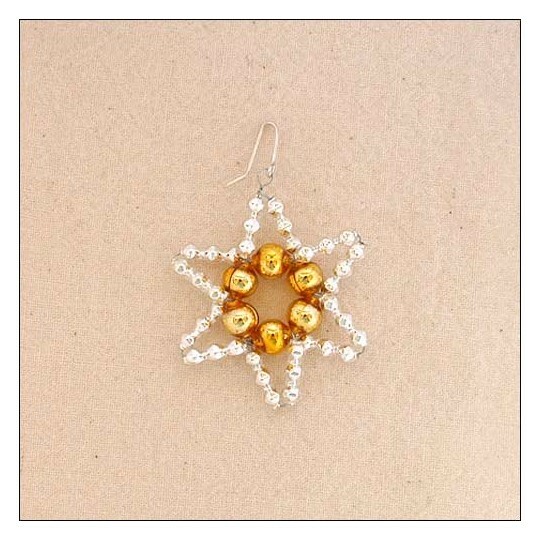 Glossy silver and gold blown glass beads handmade into a charming petite star ornament. Overall ornament is 1-3/4" across, not including hanger. Handmade in the Czech Republic. 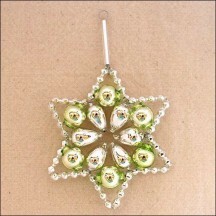 Glossy silver and pale green blown glass beads handmade into a charming petite star ornament. 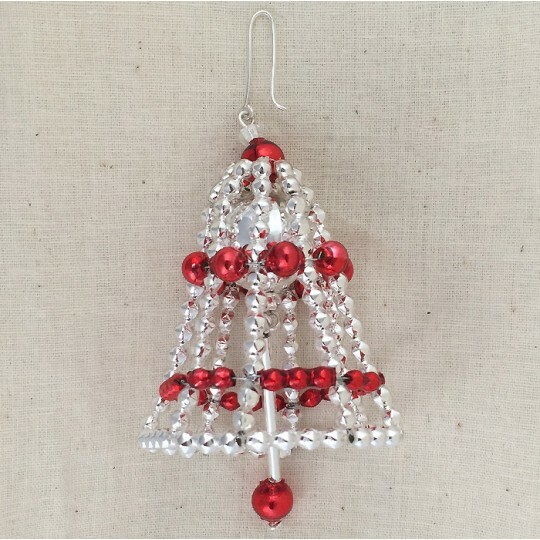 Overall ornament is 1-3/4" across, not including hanger. Handmade in the Czech Republic. 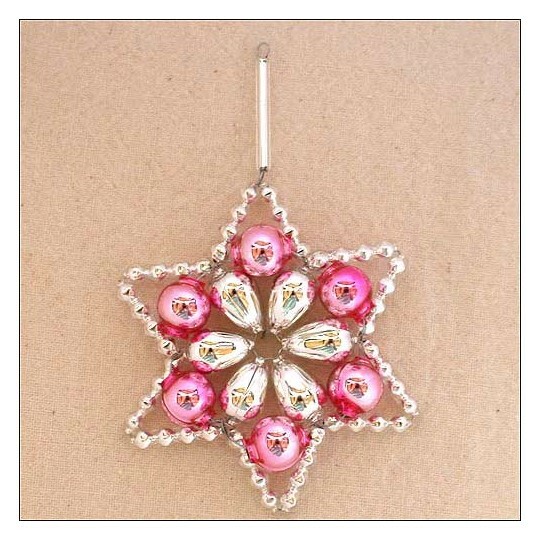 Glossy silver and pink blown glass beads handmade into a charming petite star ornament. 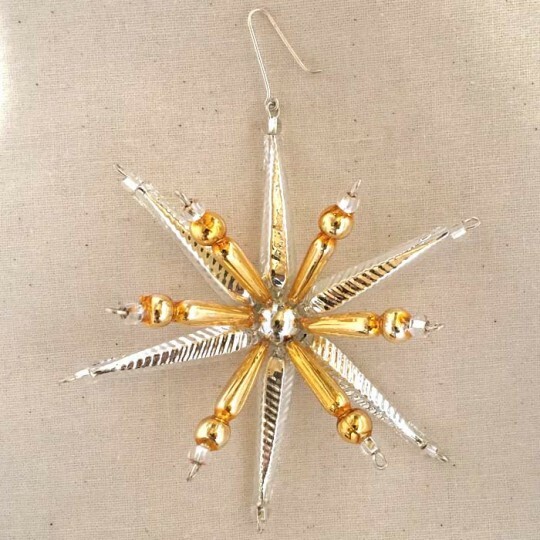 Overall ornament is 1-3/4" across, not including hanger. Handmade in the Czech Republic. 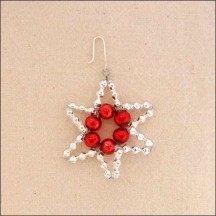 Glossy silver and red blown glass beads handmade into a charming petite star ornament. 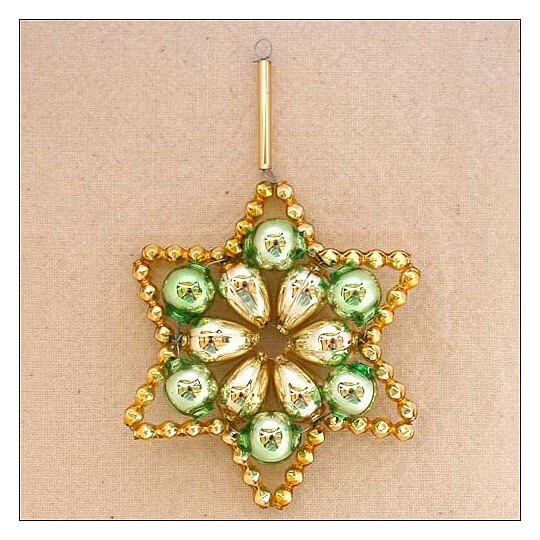 Overall ornament is 1-3/4" across, not including hanger. Handmade in the Czech Republic. 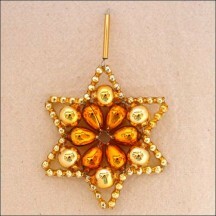 Glossy gold and pale gold glass beads handmade into a beautiful flower star ornament. 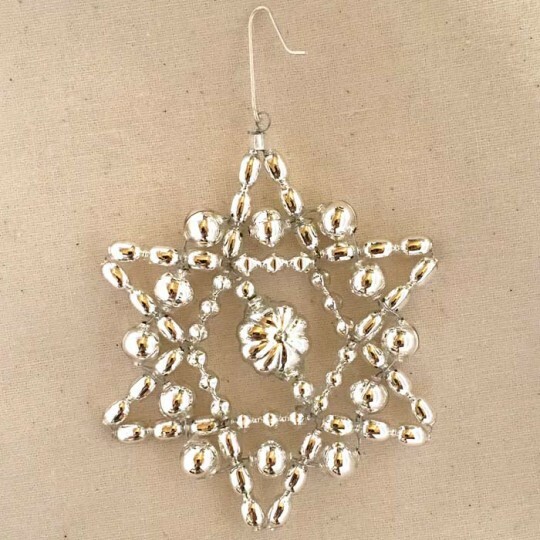 Overall ornament is 2-1/2" across, not including hanger. Handmade in the Czech Republic. 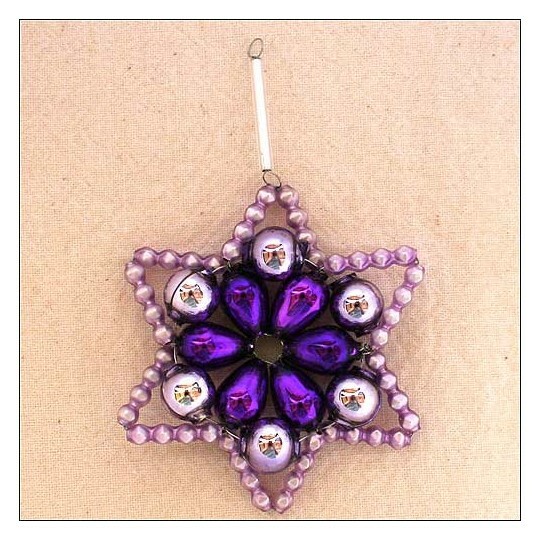 Glossy and matte beads in three shades of purple handmade into a beautiful flower star ornament. 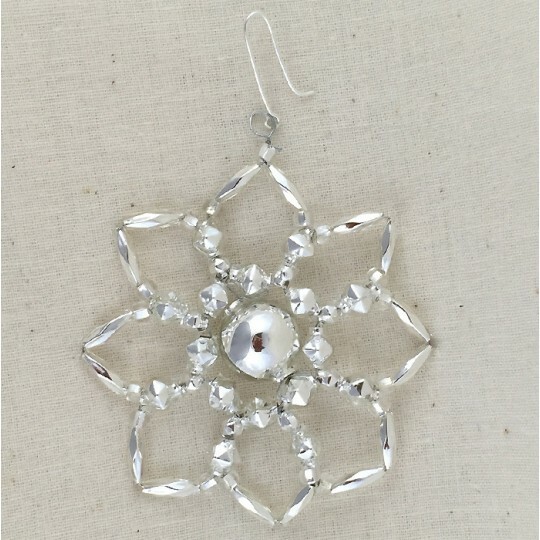 Overall ornament is 2-1/2" across, not including hanger. Handmade in the Czech Republic. 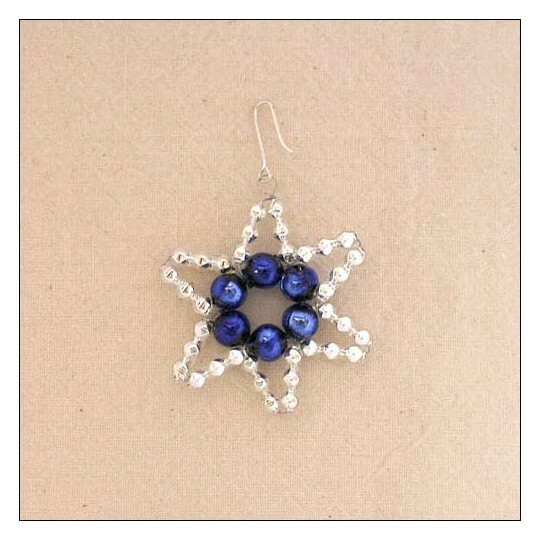 Glossy silver and blue glass beads handmade into a beautiful flower star ornament. 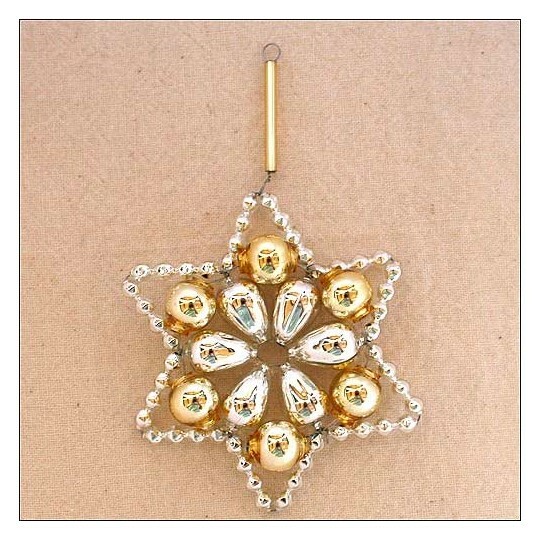 Overall ornament is 2-1/2" across, not including hanger. Handmade in the Czech Republic. 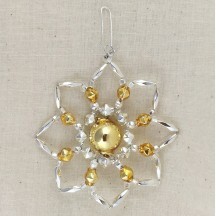 Glossy silver and pale gold glass beads handmade into a beautiful flower star ornament. 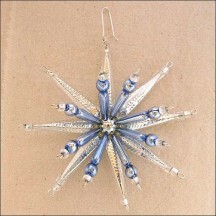 Overall ornament is 2-1/2" across, not including hanger. Handmade in the Czech Republic. 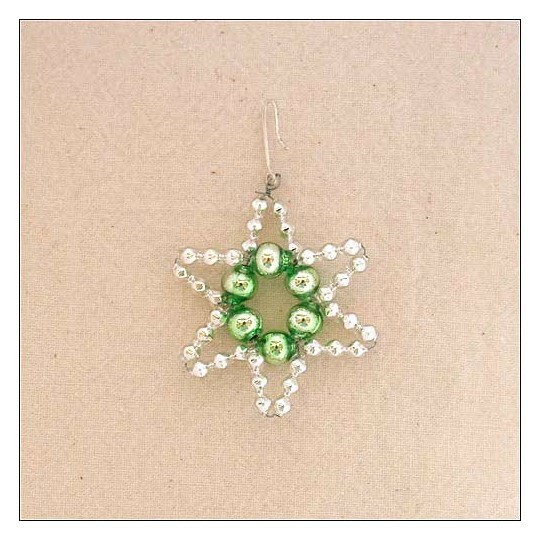 Glossy silver and pale green glass beads handmade into a beautiful flower star ornament. 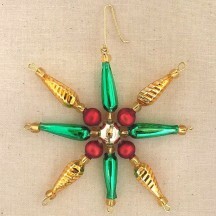 Overall ornament is 2-1/2" across, not including hanger. Handmade in the Czech Republic. 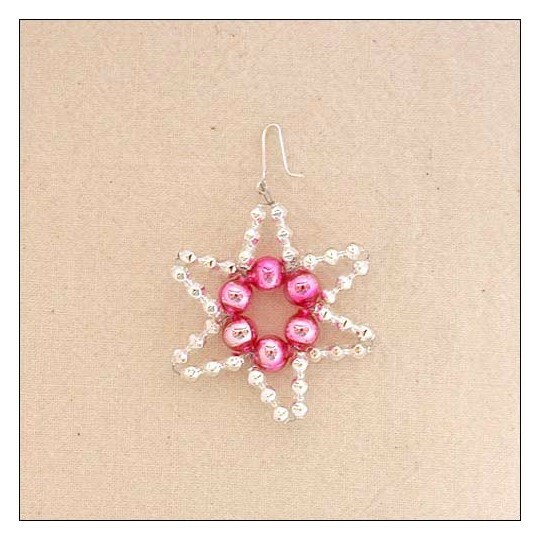 Glossy silver and pink glass beads handmade into a beautiful flower star ornament. 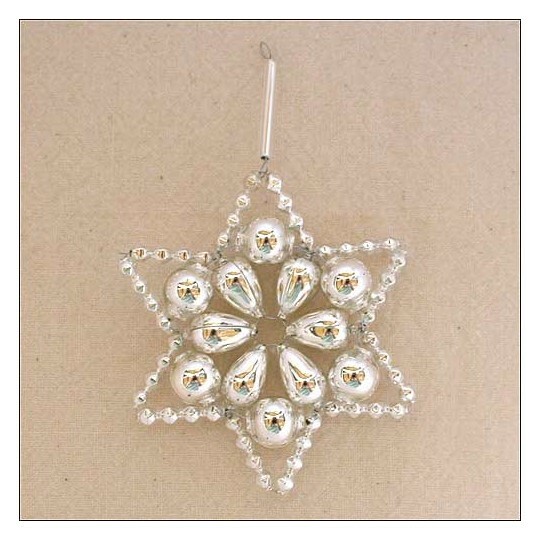 Overall ornament is 2-1/2" across, not including hanger. Handmade in the Czech Republic. 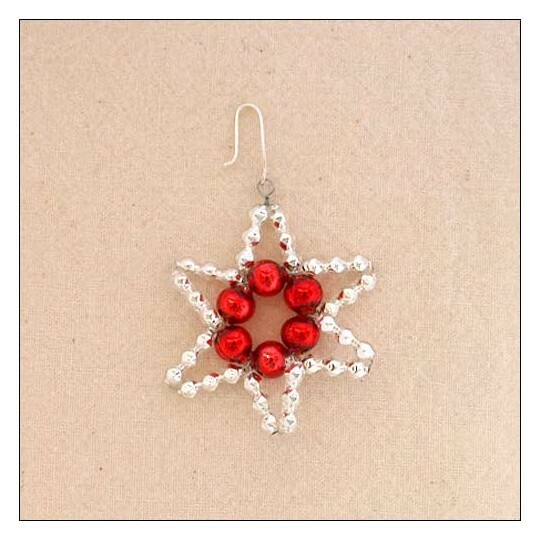 Glossy silver and red glass beads handmade into a beautiful flower star ornament. 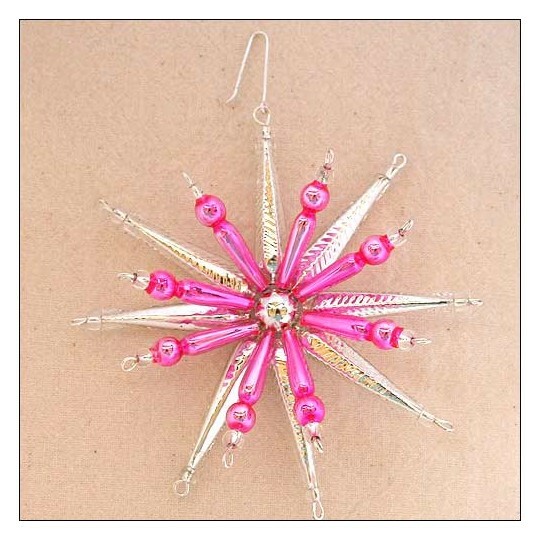 Overall ornament is 2-1/2" across, not including hanger. Handmade in the Czech Republic. 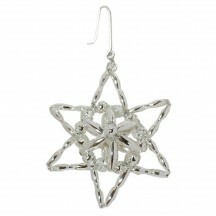 Glossy silver glass beads handmade into a beautiful flower star ornament. 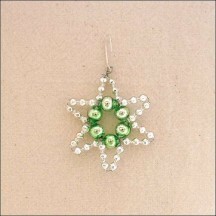 Overall ornament is 2-1/2" across, not including hanger. Handmade in the Czech Republic. 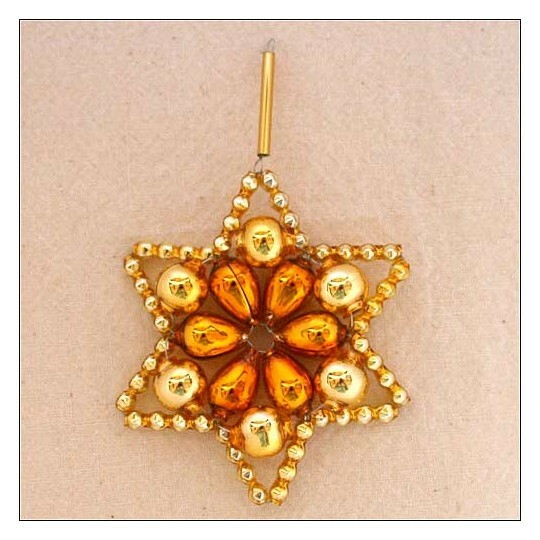 Glossy glass beads in two shades of gold handmade into a beautiful flower star ornament. 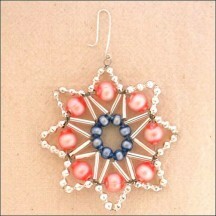 Overall ornament is 2-1/2" across, not including hanger. Handmade in the Czech Republic. 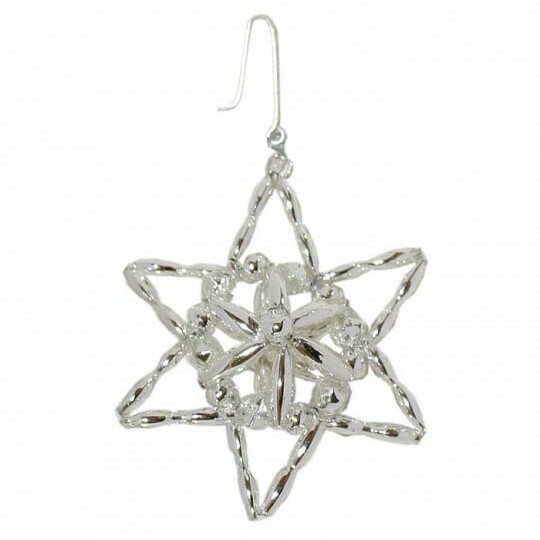 Glossy silver glass beads handmade into a beautiful 3-D star ornament. 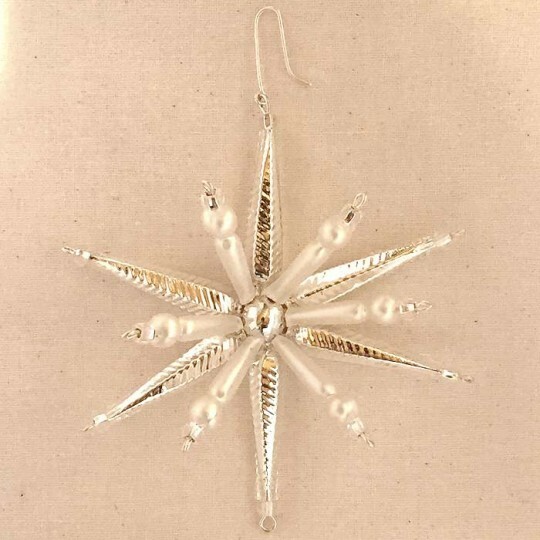 Overall ornament is 2-1/4" across, not including hanger. Handmade in the Czech Republic. 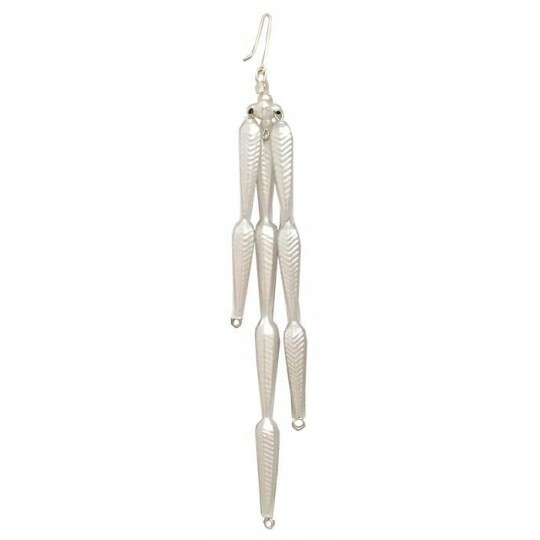 Fancy matte white blown glass beaded icicle ornement features three beaded drops of different lengths. 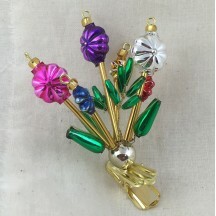 Overall ornament measures 6" long. Handmade exclusively for us in the Czech Republic. Fancy silver blown glass beaded icicle ornement features three beaded drops of different lengths. 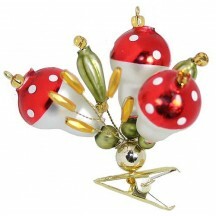 Overall ornament measures 6" long. Handmade exclusively for us in the Czech Republic. 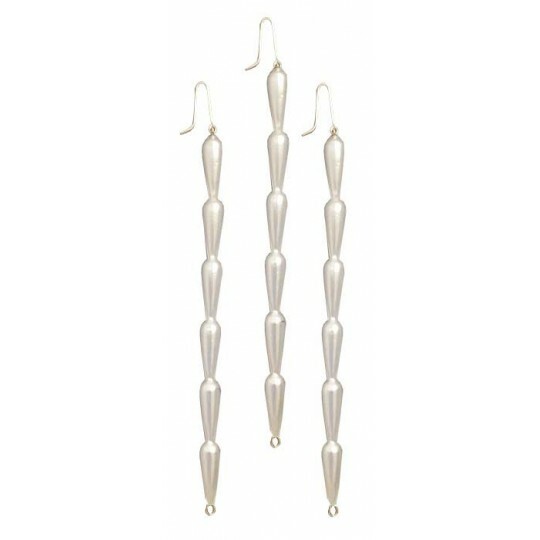 Set of 3 matte white blown glass beaded icicle ornements. 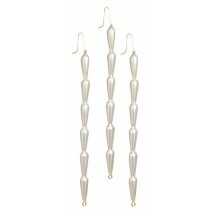 Each icicle is made from a long hand blown glass bead with 6 bumps Overall each icicle measures 5-1/2" long x 1/4" wide. Handmade exclusively for us in the Czech Republic. Set of 3 silver blown glass beaded icicle ornements. 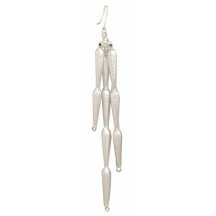 Each icicle is made from a long hand blown glass bead with 6 bumps Overall each icicle measures 5-1/2" long x 1/4" wide. Handmade exclusively for us in the Czech Republic.